Miss Jane Pittman died in 1963 at the age of 110. "Fight For Freedom" is a true story of her life from the age of ten as a slave in the "Deep South", through four wars and the biggest battle of them all - The Fight For Freedom. The story is often horrifying, sometimes funny but always courageous - the moving story of a woman whose life covered a large part of American history. This fascinating racial drama evolving around Jane Pittman, a 110-year old African-American woman who was born into slavery in the 1850’s, was certainly an odd choice for VIPCO. This 1974 effort by American filmmaker and animator John Korty – emerging as one of his best ever works – featured a rare appearance of Cicely Tyson as Ms. Pittman, in a role that earned the actress two Emmy Awards, the television equivalent of an Academy Award. 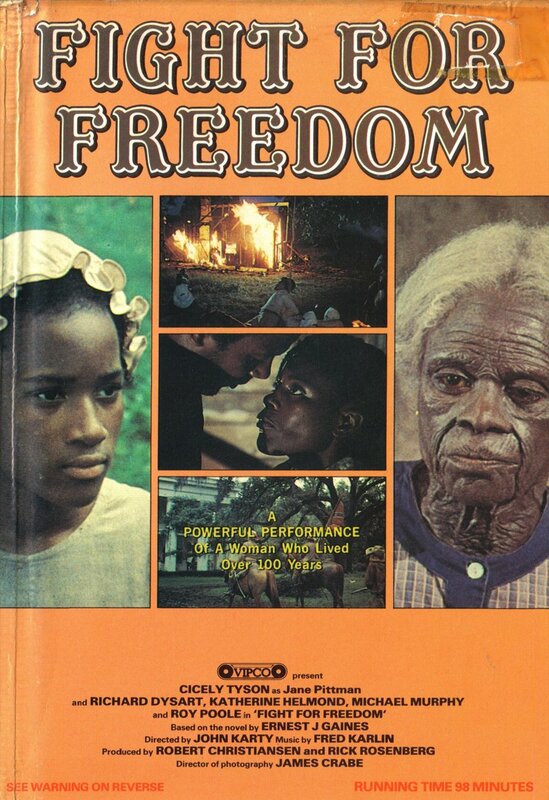 Astonishingly, Fight for Freedom, based upon the novel by Ernest J. Gaines, culminates with the actress’ undergoing extensive ageing make-up to join the American civil rights movement in 1962 at the ripe-old-age of 110. Despite it’s unusual placement within VIPCO’s then growing library of censor-baiting titles, Fight for Freedom actually appeared on tape before the label had carved that unsavoury niche for itself – within the eyes of the video trade anyway – as purveyors of potential “video nasties”, which were likely to deprave and corrupt the fragile-minded youth of our nation! Nonetheless, Fight for Freedom (original title: The Autobiography of Miss Jane Pittman) would perhaps have been better suited to almost any other pre-certificated label, most notably IFS’ whom issued three other Korty-directed films, namely: Class of ’63 (starring a youthful James Brolin who gets more than he bargained for at a college reunion), The People (starring William Shatner, hamming it up as a school teacher for extra-terrestrial children with paranormal powers) and the Metromedia-produced screen adaptation of Beatrice Sparks’ controversial novel Go Ask Alice – coincidentally also featuring Mr. Shatner! Originally handled for cinemas by Saga Film Distributors in July 1974, a diminutive outfit that wielded just two other films, including a heavily truncated edition of Mario Gariazzo’s violent Western Drummer of Vengeance – which reappeared six years later in this same watered-down version on Derek and Ann Simmonds ubiquitous Derann Audio Visual Limited label, and the ultra obscure Antonio, the latter of which very little is known. One noteworthy piece of trivia being that Korty’s drama, despite being almost two hours in length, was allegedly screened on American television with only a single commercial break. More recently however, under its original title of The Autobiography of Miss Jane Pittman, this rare and engaging drama has reappeared on the digital format, whilst sporting an uncut ‘12’ certificate, by the sizeable London-based Metrodome Distribution Ltd.